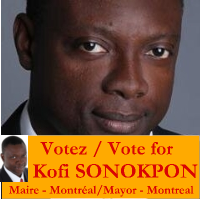 Sonokpon’s platform is: Montreal – An Autonomous and Bilingual City within Quebec and Canada. Although his platform is summarized in 4 points, two of them relate to diversity! Published by Adrienne Piggott on 2013/11/02 at 03:34 under Montreal Votes.